I created Real Estate In Stilettos as a guide to assist not only female realtors, but women in general who were starting their own brand and engulfing into a new career they had no clue about. Along the way, I have met several women through social media who's passion and drive have motivated me even more to continue to write and publish posts on my blog. 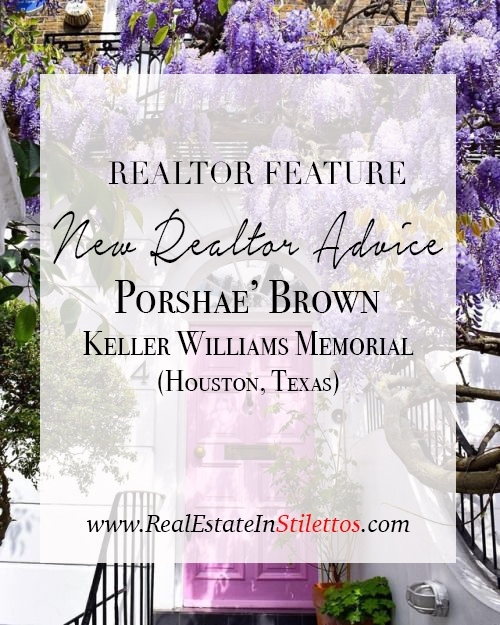 I came in contact with Porshae' Brown with Keller Williams Memorial in Houston, Texas through blogging and social media engagement. It always amazes me to see women in other parts of the country conquering the real estate industry. As every market is different, I find that it is a great way to engage in new ideas and see how they will work in our own marketplace. Porshae' was kind enough to write about her experiences as a new Realtor and I am forever grateful for having her input on Real Estate In Stilettos! And if anyone you know is looking for an outstanding realtor in the Houston area, get in touch with Porshae' and she will assist you will all of your real estate needs! About a month into applying for hospitality jobs and networking with industry leaders, nothing seemed to pan out for me. One thing that kept coming to mind was the thought of becoming a realtor. When I’d bring the idea up with family and friends I’d either hear “you’d be great at that” or “you may want to consider something less demanding”. I knew I didn’t want to just talk about it, but be about it, so I signed up for a fast track course load to get my real estate license within 8 weeks. Before receiving my licenses I sought advice from top producing agents on how to navigate my way through the beginning stages of becoming a realtor. I am eternally grateful for their encouraging words of advice and now for the opportunity to share with what I learned in hopes of making your transition into real estate an easy one. No seriously, tell every single person you know that you will be going into real estate. Ask them to think of you for their future real estate needs and to let others know as well. I can’t even begin to express to you how important the agents I talked with emphasized to “tell everyone!”. One agent in particular told me she lost out on deals from her own family members due to them not knowing she was going into real estate. She regrets not publicizing her new career from the beginning versus after receiving her license. It is never too early to get out there and network. Before getting my license, I would sift through Eventbrite for networking events that would catch my attention. Some were real estate related and some were based on my own interests. No matter the event I made it my mission to get out and meet new people. I’ve met some good connections by doing just this and I’m glad I did. Take a friend if you aren’t comfortable going alone, but definitely get use to meeting new people. As you start to update your social media it’s important for people to view you as a real estate professional. Investing in a quality headshot will be worth the money, especially once you start producing your marketing material. And speaking of marketing material it is never too early to create business cards. If you don’t have the budget starting off like I did, you can utilize the digital business card app Inigo Cards. People will be highly impressed to say the least. There is a lot that goes into starting a real estate business. It was nothing for me to reach out to people I admire who are doing what I aspire to do and succeed at. I highly suggest following other agents on social media and reaching out to them for advice. Some will be more forthcoming than others, but that’s the name of the game. Although, we are all in the same business of real estate, establishing good relationships with other agents and gaining respect through genuine conversation can only increase your chances of success. I truly hope these pieces of advice help you excel in your journey of becoming a real estate agent or business owner. We must believe and invest in ourselves, because one one else is obligated to do so. I know, I don’t know everything, so I ask questions and get answers in order to avoid mistakes for a better outcome. I wish you all the best and again thank you Nikki for allowing me this platform to share my experiences. Call me if you need me!